Janie Arand makes a game saving diving play, keeping the ball in play after everyone else thought Emily Kallmeyer's attack had fallen and New Haven had pull off the upset. Below you can watch the second and third sets in HD. New Haven, Mo. 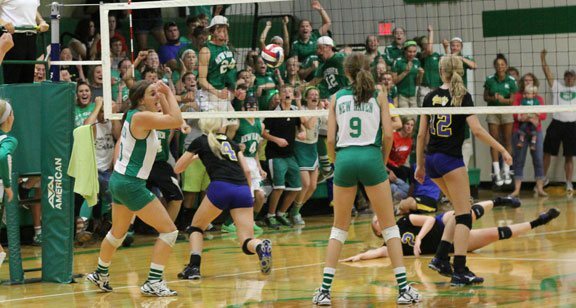 - Monday night in front of a packed house New Haven's JV team ignited Shamrock fans with their two set win over Borgia, 25-21, 25-20, remaining a perfect 14-0 and off to one of the best starts in school history. The JV's exhilarating win would be a prelude to the three set - 90 minute match that saw Borgia and New Haven tied 20 times and the lead change hands 10 times. First set in Monday's battle verse Borgia. Below is the second set of JV's two set win over Borgia on Monday night. 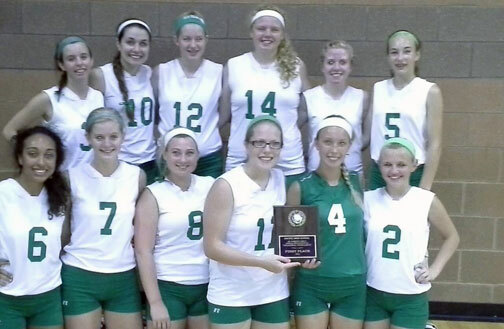 SATURDAY SHAMROCK VOLLEYBAL SUMMARY - The JV girls had a near perfect day in winning the Pacific JV Tournament for at least the second straight year, coming back after loosing their first set of the year to knock off Hermann in three sets, 19-25, 25-16, 25-14. New Haven remains unbeaten, 13-0, headed into Monday night's Highway 100 Showdown with Borgia. The Freshmen team began Saturday morning with a two set win over St. Clair, 25-17, 25-20 then split sets with Sullivan 21-25, 25-22 to finish second in their pool. "This is not a serious group-they play better when they're having a good time," Hoener says. 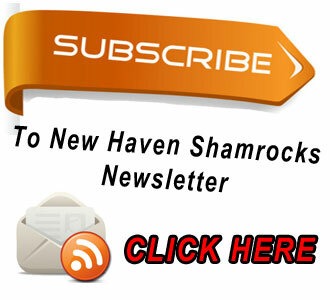 When New Haven is having fun they are not afraid to show it. Cape Girardeau, Mo. - In Friday night's second pool play match, the New Haven Volleyball team suffered their first loss on the season as Leopold pounded the Lady Rocks, 25-16, and 25-17. Leopold was also the first time New Haven faced a team capable of attacking the ball. Coach Jaime Hoener said, "Overall I thought it was a positive weekend. We can learn a lot from our losses and know what we need to work on to improve ourselves." Pictured left to right: back row: Sharon Brewster, Erin Scheer, Maddie Fleer, Lauren Bergner, Dakota Schroeder, Emma Borcherding, Kim Hoffmann, and Coach Speckhals, front row: Stephanie Russo, Brooke Bockting, Kathy Jasper, Trista Kormeier, Courtney Yowell, and Ereka Baily. Linn, Mo. 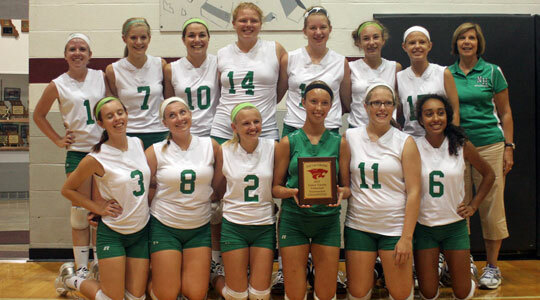 - Friday night in the Linn JV Volleyball Tournament New Haven flat out served the cover off the ball, out scoring their opponents 152-84 to remain undefeated (8-0) and once again bringing home a first place trophy. Above is our recorded live broadcast of the three set thriller New Haven vs Bernie. Below is New Haven's match vs Leopold and Emienence. Cape Girardeau, Mo - After a hard fought three set win over Bernie, New Haven faced Leopold, the same team that handed the Lady Rocks their first loss of the season in Friday night's pool play. In the first set New Haven had two set points but were unable to convert, falling short 28-26. Once Leopold get's on a roll watch out and this is exactly what happen to New Haven in the second set as the lady rocks ran out of gas loosing 25-12. 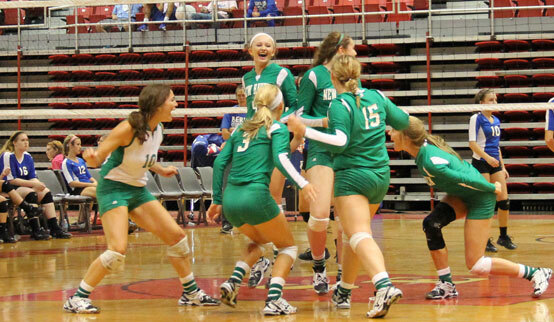 Lady rocks show a little excitement after Megan Shockley smashed a kill in the second set of Wednesday's win over Cuba. 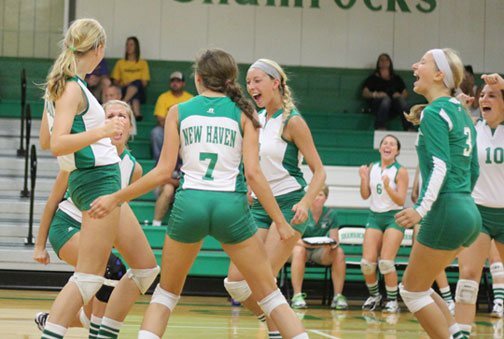 New Haven (3-0) is off to their best start in three years after upending Cuba on Wednesday night in their home opener (25-19, 25-11) before picking up wins over Father Tolton Catholic (25-16, 25-14) and Belle (25-13, 25-15). While New Haven has yet to be tested, one concern Coach Jaime Hoener had coming into the season has turned out being the teams biggest attribute. Coach Hoener shows a little excitement after Taylor Covington makes a nice dig during practice. New Haven is coming off their third straight 20 win season after a disappointing two set loss to Valley Catholic in last year's district title match, 25-18, 25-21. While the Lady Rocks have a large void to fill after graduating three time All-State senior Kelsey Pecaut, who lead the team in service points, attempts, aces, kills, and digs, Head Coach Jaime Hoener expressed little concern. Pictured are girls in grades four through six who attended last weeks summer volleyball camp. --Over 70 girls turned out for last week's summer volleyball camp. The students were divided up into three sessions: high school, middle school, and grades 4-6. Head Coach Jaime Hoener, former head coach and teammate Julie Westermeyer, as well as assistant coaches Sharon Speckhals and Dennis Carey worked with players throughout the week focusing on fundamentals, teamwork, and respecting tradition. Hoener began their final day of camp on Thursday explaining the significance and meaning behind this year's camp T-shirts and remembering to respect tradition. 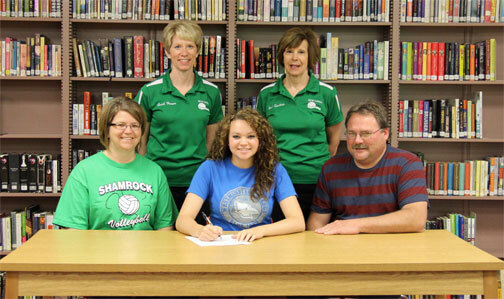 Kelsey signs her academic scholarship to attend Westminster College where she will play on the Blue Jay Volleyball team. New Haven, Mo. - Senior Kelsey Pecaut will be attending Westminster College this fall on an academic scholarship, continuing her volleyball career at the collegiate level.